Randwick is a suburb in the Eastern Suburbs of Sydney, in the state of New South Wales, Australia. 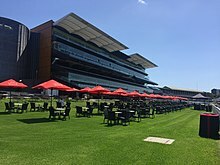 Randwick is located 6 kilometres south-east of the Sydney central business district and is the administrative centre for the local government area of the City of Randwick. Randwick is part of the Eastern Suburbs region. The postcode is 2031. Randwick was named after the village of Randwick, Gloucestershire, England, birthplace of Simeon Henry Pearce, who became Mayor of Randwick no less than six times. Simeon and his brother James, who migrated to Australia in 1842, were responsible for the early development of Randwick as well as suburb Coogee. Simeon lived in a house called Blenheim, which can still be seen in Blenheim Street. It was neglected for some time but was eventually acquired by Randwick City Council and restored. Proclaimed as a Municipality in February 1859, and as a City in 1990, Randwick has a rich history and a number of heritage buildings. Another Mayor of Randwick, George Kiss, built the house known as Ventnor in the 1870s. A two-storey sandstone house, Ventnor is situated on Avoca Street, overlooking Coogee. It is now owned by the nearby Our Lady of the Sacred Heart Church (built 1888). Other buildings of note include the St Jude's Church group, also on Avoca Street. Originally designed by Edmund Blacket, (who also designed St. Andrew's Cathedral, Sydney and the University of Sydney), the church was completed in 1865. It was modified by H.M. Robinson in 1889. The rectory next door was built in 1870. The Verger's Residence, designed by Thomas Rowe and completed in 1862, was the original Randwick Burough Chambers. This distinctive building, with its Gothic touches, was followed by the present Randwick Town Hall, which was built in 1886. The church group and Ventnor are listed on the Register of the National Estate. Further down Avoca Street is the sandstone building originally known as the Star and Garter Inn, built in the 1830s. It was the home of Captain J. Watson, who was responsible for the memorial to Captain James Cook, which still stands at front of the building. One of the dominant features of the area is the Prince of Wales Hospital, which started life as a home for destitute children. It was financed by the legacy of Dr. Cuthill, who now has Cuthill Street named after him. In 1915 the home became a military hospital and continued to grow as a medical facility. Other noteworthy buildings include private homes like Ilfracombe, Clovelly and Torquay, in Avoca Street, and Venice, in Frenchmans Road. The latter was built 1884-84 on part of St Mark's Glebe. The land had been leased in 1880 for 99 years to S.Holmes and J.Parsons. The house features Tudor and Gothic elements and has stained glass windows. It has been described as a "comparatively rare and distinctive example of late Victorian Gothic architecture retaining most of its detailing intact." It has a New South Wales heritage listing. Another notable home was Sandgate, located in Belmore Road. This sandstone house was built circa 1870 on land granted to Simeon Pierce in 1853. It was bought by the Federal Government in the 1920s; it was then used as a Red Cross facility for First World War veterans. It was saved from demolition in 1978 and restored by Randwick Council. 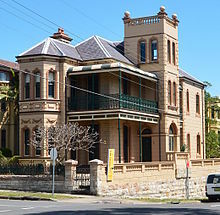 The last Gothic mansion left in Randwick is Nugal Hall, located in Milford Street. It was designed by Mortimer Lewis and the southern portion of the house was built in 1853 for Alexander McArthur, a shipping merchant. The house features a staircase with glass dome above; the staircase was built of Mauritius mahogany and cedar. The coach house building at the front was originally a lodge for horse-drawn vehicles. The northern portion of the house was completed by Dr Fred Tidswell who owned the Coogee Bay Hotel. The architect of the northern portion is thought to have been Mortimer Lewis's son, Oswald. The Tidswell family owned the house from c. 1880 – 1903. Frederick Squire Tidswell (1831–1898) and his wife Mary Ann (1836–1912) had nine children including the microbiologist Dr Frank Tidswell (1867–1941) and architect Thomas Tidswell (1870–1950). The following structures are listed on the (now defunct) Register of the National Estate (unless stated otherwise), or the heritage schedule of Randwick Council's Local Environment Plan; the latter list includes approximately four hundred items. In the 2016 Census, there were 29,986 people in Randwick. 51.7% of people were born in Australia. The most common countries of birth were England 6.0%, Ireland 4.0%, China 3.7%, New Zealand 2.3% and South Africa 1.5%. 67.6% of people only spoke English at home. Other languages spoken at home included Mandarin 4.0%, Spanish 1.8%, Greek 1.7%, Russian 1.6% and Cantonese 1.3%. The most common responses for religion were No Religion 33.7% and Catholic 27.4%. 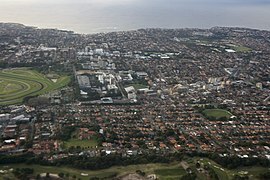 Randwick is primarily a residential area. The Randwick Racecourse takes up a large portion in the north-west corner of the suburb. The Prince of Wales Hospital, Royal Hospital for Women, Prince Henry Hospital and Sydney Children's Hospital are all located in Randwick. The main commercial area is centred on Belmore Road. A range of retail stores are located at Belmore Road along with two shopping centers (Royal Randwick Shopping Center and Randwick Plaza, which contains a Coles Supermarket) on eitherside of Belmore Road. Avoca Street is also quite popular for commerce, there is the 150 year old Coach and Horses Hotel. Where the two busy streets meet is the gourmet Cookhouse, a heritage sandstone building with a statue of Captain Cook outside and High Cross Park, with a war memorial. Within one kilometer, Coogee is another retail precinct offering good food services while enjoying the great view of the beach. The Spot at the Perouse and St Pauls Road junction also wins good fame for its popular restaurants, cafés and recreational facilities. Randwick's main entertainment district is The Spot, located in the suburb's south-east, which contains the Randwick Ritz cinema, a famous art deco cinema which dates from the 1930s and numerous cafes, bars and restaurants. Just 6 kilometres east of Sydney’s CBD, the City of Randwick, once known as the ‘Sports Coast’ is home to some 29 km of coastline, 10 beaches and bays and many major recreation facilities. Randwick City is one of the most visited tourist areas outside central Sydney, attracting some 13 million visits each year. The City is home to the Coastal Walkway, Randwick Racecourse, Coogee and Maroubra Beaches, Botany Bay National Park, Centennial Parklands (which includes Queens Park and Moore Park), several top class golf courses and major institutions including the University of New South Wales and the Prince of Wales Hospitals. A number of well-known sporting teams represent the local area. Since 1882 the Randwick District Rugby Union Football Club nicknamed the 'Galloping Greens' or 'The Wicks' have represented the district in the Sydney premier grade rugby competition, the 'Shute Shield' and play their home games at the picturesque Coogee Oval. The local cricket team Randwick Petersham Cricket Club plays in the Sydney Grade Cricket domestic competition and was formed through a merger between Randwick and Petersham Cricket Clubs. Randwick has been jointly represented in the National Rugby League by the Sydney Roosters, formally the Eastern Suburbs District Rugby League Football Club and the South Sydney Rabbitohs Rugby League Football Club. Local derby contests between these two neighbouring teams are always fiercely contested. Junior rugby league teams include the Clovelly Crocodiles, the Coogee Dolphins and Coogee Randwick Wombats. 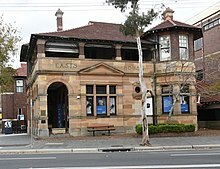 The former Randwick Post Office building in the centre of Randwick Junction (corner of Alison Road and Avoca Street) is known as Easts House. The building is owned by the Sydney Roosters (Eastern Suburbs Rugby League Club), which has donated the building for use by the Ted Noffs Foundation, for the purpose of providing assistance to troubled youth in the district. There are numerous community or corner parks like Alison Park, Randwick Peace Park, Frank Doyle Park, Fred Hollows Reserve and Writtle Park in the locality of Randwick used for recreational and sporting purposes. Primary schools in the area include Our Lady Of The Sacred Heart, Coogee Public School, Claremont College, Randwick Public School, Coogee Preparatory School, The Joseph Varga School  and Rainbow Street Primary. 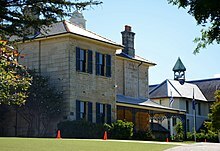 Secondary schools include two systemic Catholic schools, Brigidine College and Marcellin College, a Jewish day school Emanuel School  and three state schools, Randwick Boys High School, Randwick Girls' High School, and the Open High School. Randwick North High School was closed in 2001 and the site was divided between Open High School and Randwick Public School. There are branch campuses of the University of New South Wales and Sydney Institute of TAFE located on King Street, between the Racecourse and Centennial Park. Randwick is currently only served by buses. The main bus corridor is Belmore Rd with buses to Bondi Junction, Burwood, Campsie, Coogee, Eastgardens, Maroubra, Sydney Airport and Sydney CBD. On 13 December 2012, the NSW Government announced a commitment to build the CBD and South East Light Rail from Circular Quay down George Street to Central Station, then across to Moore Park and down Anzac Parade. South of Moore Park the line will spit into two branches - one of which will head to Randwick via Alison Road. A bus/tram interchange will be established in Randwick and many of the bus routes that currently traverse Anzac Parade to access the city would be replaced by feeder routes connecting to the light rail. Construction commenced in 2015. ^ a b Australian Bureau of Statistics (31 October 2012). "Randwick (State Suburb)". 2011 Census QuickStats. Retrieved 14 August 2017. ^ "Nugal Hall". New South Wales State Heritage Register. Office of Environment and Heritage. Retrieved 26 November 2017. ^ "Frank Tidswell 1867-1941". Mundia. Retrieved 21 May 2012. 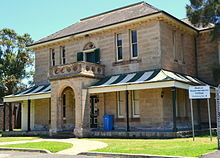 ^ "Randwick Post Office (former) and Jubilee Fountain". New South Wales State Heritage Register. Office of Environment and Heritage. H01409. Retrieved 18 May 2018. ^ "Randwick Presbyterian Church". New South Wales State Heritage Register. Office of Environment and Heritage. H01777. Retrieved 18 May 2018. ^ "St. Jude's Anglican Church, Cemetery, Rectory, Vergers Residence". New South Wales State Heritage Register. Office of Environment and Heritage. H00012. Retrieved 18 May 2018. ^ "Corana and Hygeia". New South Wales State Heritage Register. Office of Environment and Heritage. H00454. Retrieved 18 May 2018. ^ "Sandgate". New South Wales State Heritage Register. Office of Environment and Heritage. H00067. Retrieved 18 May 2018. ^ "Substation". New South Wales State Heritage Register. Office of Environment and Heritage. H00935. Retrieved 18 May 2018. ^ "Venice". New South Wales State Heritage Register. Office of Environment and Heritage. H00175. Retrieved 18 May 2018. ^ "Hooper Cottage". New South Wales State Heritage Register. Office of Environment and Heritage. H00087. Retrieved 18 May 2018. ^ "Nugal Hall". New South Wales State Heritage Register. Office of Environment and Heritage. H00173. Retrieved 18 May 2018. ^ "Electricity Substation No. 349". New South Wales State Heritage Register. Office of Environment and Heritage. H01792. Retrieved 18 May 2018. ^ "Rathven". New South Wales State Heritage Register. Office of Environment and Heritage. H00139. Retrieved 18 May 2018. ^ "Ritz Theatre". New South Wales State Heritage Register. Office of Environment and Heritage. H00348. Retrieved 18 May 2018. ^ "Emanuel School". New South Wales State Heritage Register. Office of Environment and Heritage. H00386. Retrieved 18 May 2018. ^ "Avonmore Terrace". New South Wales State Heritage Register. Office of Environment and Heritage. H00565. Retrieved 18 May 2018. ^ "Big Stable Newmarket". New South Wales State Heritage Register. Office of Environment and Heritage. H00388. Retrieved 18 May 2018. ^ "Sydney's Light Rail Future". Transport for New South Wales. 13 December 2012. pp. 15, 24. Retrieved 14 December 2012. ^ "Sydney's Light Rail Future". Transport for New South Wales. 13 December 2012. pp. 13, 16, 17. Retrieved 14 December 2012. Wikimedia Commons has media related to Randwick, New South Wales.